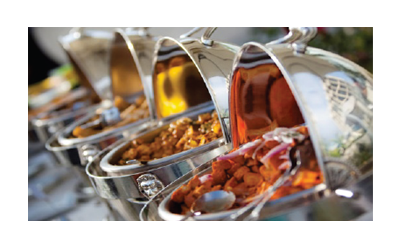 Bawarchi Biryani Point specializes in catering for Weddings, Special Events and Large Gatherings(1000+). We will take your worry away about food and let you focus on celebrating the special occasion. Order Catering Online through ezCater. Click on link Below. Prices offered are for Minimum 50 Guests and Maximum 150 Guests. Contact us for Special Event pricing for more than 150 Guests or events like Weddings. Delivery and Setup Charge of $75 will be added for all onsite catering events. 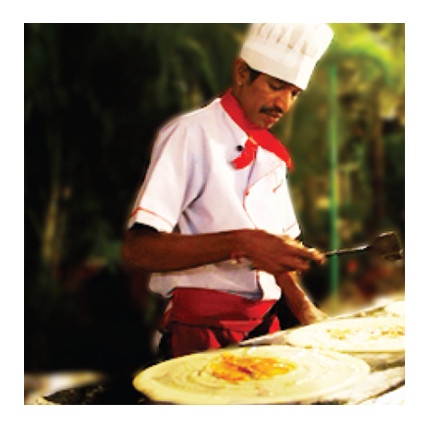 We offer Live Dosa Counter with multiple types of Dosa made by our expert chefs on location. Plain, Masala, Paneer, Mysore Masala Dosa are offered. Add Idli, Vada or Pongal for extra $1.95 Per Person. We offer Live Chat Counter with multiple types of Chat made by our expert chefs on location. Contact us for package prices for this unique and tasty offering. We offer Live Tandoori Counter for Nan, Sizzlers and grilled meats made by our expert chefs on location. Contact us for package prices for this unique and tasty offering. Lamb/Mutton/Shrimp sizzlers extra $1.95 Per Person. All prices listed are for Small or Half Tray which serves 12-15 People for Curry / Appetizer and 8 - 12 people for Biryani. 50% Advance required at Order Time. Add $10 for Paneer Dishes and $20 for Lamb and Shrimp Dishes. For Samosa, Chicken Lollipop and Chili Drums estimate 25 pieces for Small Tray. Add $10 for Paneer Biryani, Add $5 for Special Flavors Like Avakai, Gongura etc. Prices offered are for Minimum 30 Guests and Maximum 150 Guests. Contact us for Special Event pricing for more than 150 Guests or events like Weddings. 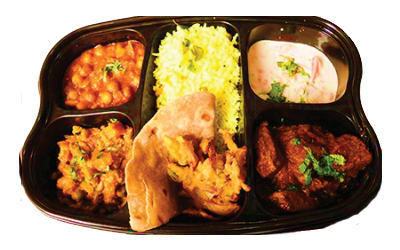 Quantities provided are based on mixed serving in Buffet Style with all the items in the Package. For more limited menu items please order by the tray. Biryani platter includes your choice of Veg/Chicken/Mutton Biryani, Appetizer, Veg/Non-Veg Curry, Half Nan and Dessert. Curry platter includes your choice of 2 Curries, Appetizers, Half Nan and Dessert. Your Choice of Paneer or Chicken Roti Roll served with side of Chips. Please call us at (972) 474-8844 or send us an email to bawarchi.richardson@gmail.com to talk to our catering specialist and give us the opportunity to make the event even more memorable.